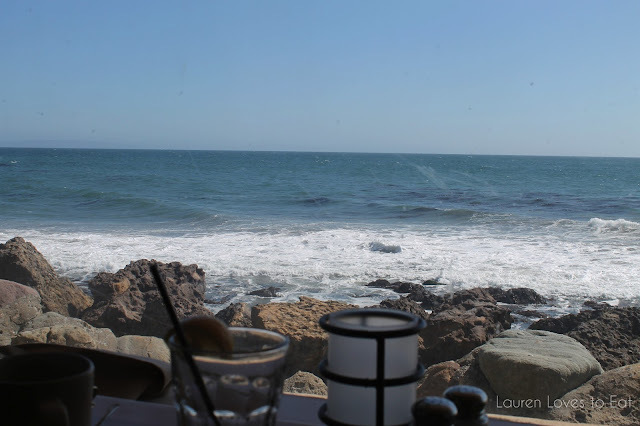 Jing and I used to love visiting Duke's Malibu back in College. It was such a treat to drive out to PCH from downtown and from the east side to take in the pretty cars, the ocean, and the beautiful houses along the coast. 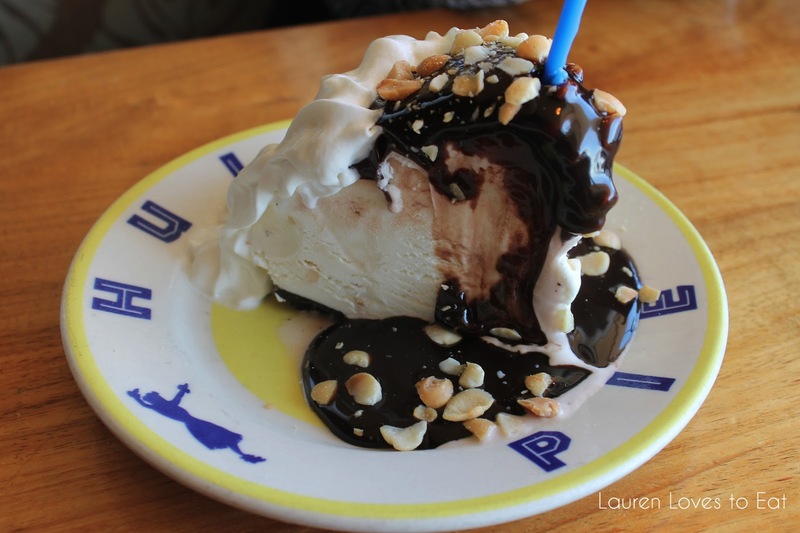 Duke's serves Hawaiian food and drink, and although the menu is not long, all you need to know is that the fish entrees are superb, and the ice cream pie is the cherry on top. You can choose a type of fish, which the restaurant changes depending on the season and the fish's sustainability, and then choose how you would like it prepared-- parmesan and herb crusted (shown below), or roasted firecracker (chili and cumin aioli glaze with black bean, tomato, onion and avocado salsa). If you don't have room for a full meal, you can hang out at the Barefoot Bar and drink a Lava Flow. From what I remember, the cocktails here were pretty tasty. Prices are very reasonable for this location and food, and there is valet parking for $4 at the restaurant, as well as a ton of street parking along PCH. The view from our window booth. 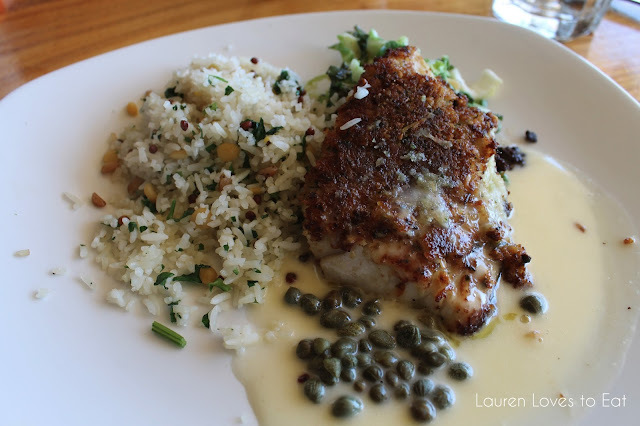 Parmesan & Herb Crusted Barramundi, $15 (market price): Sauteed with panko, macadamia nuts, lemon, and capers. The server recommended the barramundi, an Australian fish, saying that it would go well with the parmesan & herb crust. It was amazing. I was slightly worried that we would be disappointed because we had such great memories of this place and hadn't been back in over 4 years, but this totally surpassed my memories. The crust had a great slightly crunchy texture, the fish itself was terrific, and the sauce was out of this world. Hula Pie, $7.50 (or free if you're celebrating a birthday! ): Macadamia nut ice cream, Oreo cookie crust, hot fudge, whipped cream. The epitome of indulgence and worth every bite. *Make sure to request a window table whether you make the reservation on the phone or on Open Table, otherwise there will likely be a wait if the request is made when you arrive. I swear I gain 5 lbs a day looking at your blog :) That pie looks AMAZING! Haha I'll eat extra for you next time! 'Twas! We need to go to L.A. together! This looks delicious Lauren.. fish is something I do eat. Love the scenic views. never tried Hawaiian food.